One of the most important components of an AFM is the probe. AFM probes are made of a chip or substrate, a cantilever, and a tip. Usually, these are manufactured in one piece of silicon (or silicon nitride, Si3N4), by MEMS manufacturing techniques. In this way a wafer (with 400 or more probes) is manufactured at one time, with reasonable reproducibility of probe characteristics across the probes. 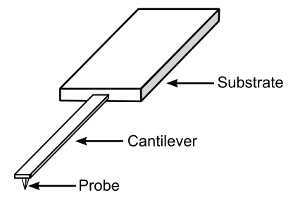 Design of typical AFM probe, showing the substrate, cantilever and tip (probe). Importantly, nearly all probes are interchangeable, so it’s possible to use probes from different manufacturers in your instrument. Thus, there is a fairly competitive market in AFM probes, and you can find a variety of probes from value to high-cost offerings, and an enormous range of probes, with different coatings, and physical properties, suitable for a wide range of applications. There are so many different probes here, that it’s not worth listing them all, so this page just links to the manufacturers of probes that I know of. Some companies resell probes from other manufacturers,such distributors are listed on this page. But here I list only the manufacturers. The manufacturers are listed in no particular order. Bruker (until recently Veeco) manufacture a huge range of probes, as well as reselling probes from various other producers. They have many representatives, as well as selling direct in the U.S.
Artech Carbon make single-crystal diamond porbes, which are very sharp and wear-resistant. Nunano is a Bristol (UK)-based startup specialising in SPM probe manufacture. Offer custom probe design. Once again, distributors can be found here. If I any have missed any manufacturers ,or made any other errors, please feel free to make suggestions, via the contact page.